Plump, sweet and delicious. Classic White Grapefruit is the favorite of many grapefruit lovers. White Grapefruit is very low in Cholesterol, Saturated Fat, and Sodium. It's also a great source of Dietary Fiber and Potassium, and an excellent source of Vitamin C.
Good quality White Grapefruit have smooth, firm and shiny skin. Choose fruit that is round and slightly firm with no blemishes or soft spots. Pick fruit that is medium to large and heavy for its size. Most white grapefruit will have a rich to pale yellow coloring. Some varieties will "re-green" if they remain on the tree long enough. This does not affect the flavor or quality of the fruit. Grapefruit keeps at room temperature for at least a week. For longer storage, refrigerate in a plastic bag or in the covered vegetable crisper . Serve grapefruit at room temperature. If it has been refrigerated, leave it out for a few hours before use. 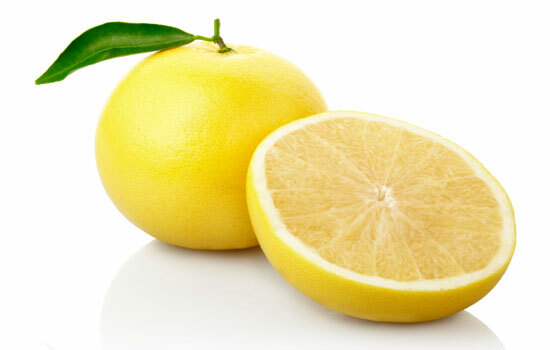 Grapefruit is popularly eaten by slicing the fruit in half and eating its center with a spoon. Grapefruit can also be peeled and used in salad .Some people prefer to remove the sectional membrane, others leave it on.